Rebellion says that the launch day DLC maps included with the Aliens vs. Predator Special Edition will be released to everyone soon after the game comes out. Along with the regular version, the new Aliens vs. Predator game from Rebellion will also be available in an impressive Hunter special edition, which will include among other loot a fully-articulated model of a facehugger. That should be good enough for just about everyone, but as an extra bonus the package will also come with four "day one DLC" multiplayer maps. Don't worry about missing out if you're not willing to spring for the admittedly pricey special edition, though: The maps will be given to everyone soon after the game launches. "Downloadable content on day one for those who purchase the Special Editions will consist of four brand new multiplayer maps: Two new Survivor maps and two for the other multiplayer modes," said Tim Jones, the head of art and design at Rebellion. "That will become available to everybody else soon after release." Post-launch DLC is also planned, he added, advising gamers to "watch this space" for updates. 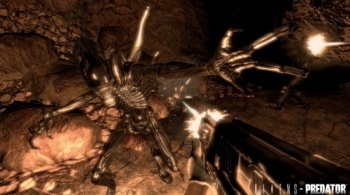 Jones said that gamers are preordering the Aliens vs. Predator special editions in large numbers, which he attributed at least in part to the fact that it's been so long since the last AvP game. "There are swathes of people that have waited a very long time for this game and there's no question they'll want something to remember it by," he said. "The special editions provide that something special. And I think the pre-order numbers we're seeing demonstrate just how eager people are to get their hands on this game." Aliens vs. Predator comes out on February 16 in North America and February 19 in Europe for the PC, PlayStation 3 and Xbox 360.